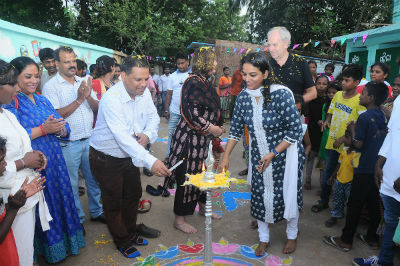 Bhubaneswar: Socio-developmental initiatives implemented in the slums of Bhubaneswar Town Centre District (BTCD) under Socially Smart Bhubaneswar programme has received praise from the visiting UNFPA officials to the city. Under this initiative, a joint venture of Bhubaneswar Smart City Limited, Bhubaneswar Municipal Corporation and UNFPA India, various developmental and capacity building activities are being implemented through adolescent peer leader girls and boys identified by Humara Bachpan Trust. A presentation on social interventions and a short video film on various activities under socially smart Bhubaneswar were shown to the visiting dignitaries Jennifer Butler, Deputy Regional Director, Asia Pacific, UNFPA and Venkatesh Srinivasan, Assistant Representative, UNFPA. Impressed with the activities and its positive impact on the community in these slums, both the officials visited Shanti Nagar slum in Kharvel Nagar area today evening. As the residents of Shanti Nagar slum and peer leaders accorded a traditional welcome with flower petals and drums, the visiting dignitaries took a tour of the slum witnessing the thematic murals created on the walls spreading social messages on gender based violence and social equity. Among others Dr. Deepa Prasad, State Programme Coordinator, UNFPA India, Bijay Kumar Swain, General Manager (Operation), BSCL, Kumar Manish, State Program Officer, UNFPA India, Dharitri Pattnaik, Founder Mentor, Humara Bachpan also encouraged the young peer leaders who had organised this special visit programme. A group of peer leader girls performed a street play on gender equity and domestic violence while another group of adolescent girls demonstrated various self-defence postures which they had learned during the 10 days self-defence training provided to the girls from BTCD slums under Socially Smart Bhubaneswar initiative. Some of the young girls shared their journey as peer leaders under socially smart Bhubaneswar narrating how it could bring change in their confidence level by helping them to become smart and take leadership to help mitigate issues of the community. Presenting her story, eighteen years old Usha Bisoi from Shanti Nagar slum narrated how they had a very restricted movement inside the slum before the programme was commenced a year ago and now they are able to turn an open defecation site into a playground where girls can play without any fear.